I’m so excited to be back here at The CSI Project! I’m Paula from JC’s Loft. Today I want to show you how to create a Fresh Flower Wreath. You might remember my candlestick tutorial I shared with you last month. Well this month I’m bringing you a FRESH idea. 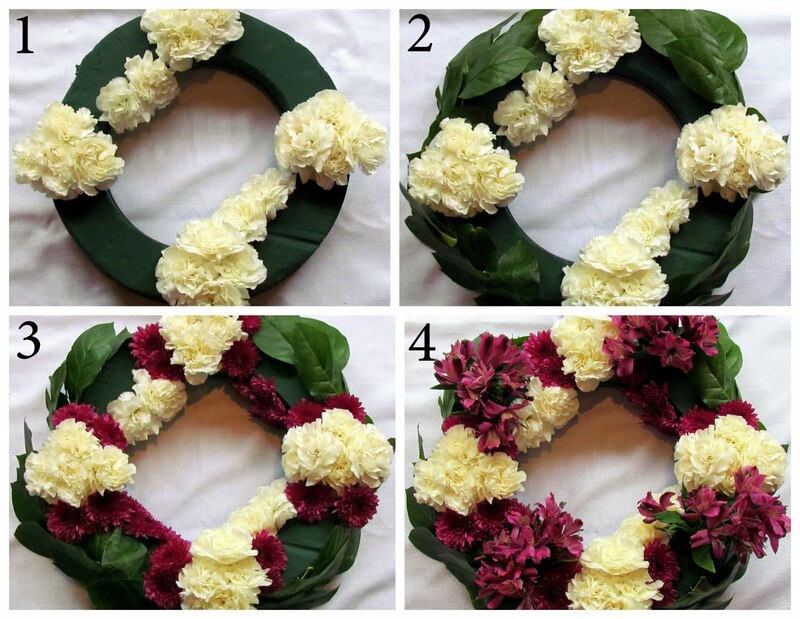 A FRESH FLORAL WREATH tutorial…insert excitement HERE!! There have been some UHmazing wreaths showcased here on The CSI Project, but I haven’t seen one using fresh flowers. So pull that hair back in a pony and dust off your floral shears…let’s get started! – Flowers Flowers and more Flowers. I purchased 7 bundles from WalMart for $5 a piece and 1 bundle of greenery. Your flowers should come with little packets of flower food. You want to mix that into warm water and let your wreath form soak in it. Mine is a 15" wreath so I used my bath tub because I didn’t have a container big enough. DO NOT push the wreath under water because it can create air pockets in the wreath. Let the wreath sink to the bottom and once it is fully submerged it’s done! tied a bow at the top and THEN when I lifted it up it snapped off! So wrap your ribbon around the actual wreath and you’ll be good to go. I started by making punches of white carnations around the wreath. Next I took my greenery and stuck them around the outside of the wreath. Probably should have done this first step but I’ve never made a fresh floral wreath before. Time for some color with my purple button mums! Next were lavender flowers to add some dimension. I filled in the holes with Spider Mums which made for a fabulous finishing touch. I’m thinking this would make a great Mother’s Day gift right? Forget the usual flower arrangement and whip up one of these. How excited will your mom be? Here’s a side view so you can see the greenery. The best part about this wreath is that is serves double duty as a centerpiece. a GORgeous centerpiece for your Mother’s Day Brunch! I hope you enjoyed my Fresh Floral Wreath tutorial today. Thanks to the CSI gals for having me over again! Please stop by JC’s Loft and check out my other projects. How can I find a link to JC’s Loft? This is fantastic! Fresh flowers are so much cheerier than silk. Hopefully it will last for a while! Well done Paula! Love the fresh flowers, I’m sure my mom would be so happy to receive a fresh wreath for Mother’s Day. I hate carnations. And you made em look not cheap, good job! Oooh, I love fresh flowers! This is a beautiful wreath. I’ve considered making a fresh wreath before, but worried that I couldn’t pull it off. Thanks so much for the encouragement!